Welcome to in.complete.stitches. I’m Sarah and I have always loved to work with my hands, be it drawing, knitting, model making, lino-cutting, Lego (yes, Lego is well and truly back in my life after a 30 year absence!) and of course sewing. My two messers; No.1 and No.2 in their Raglan Tees by Brindille and Twig, fabric by Elvelyckan Design, April 2018. I work for most of the day as an architect with my husband in our practice, Keller Architects. (www.kellerarchitects.com) At home we have three small maggots running around but at night, when all is quiet, I satisfy my sewing addiction. In fact, at this point I can’t be sure if I buy fabric to feed this sewing addiction, or sew to justify my fabric addiction. Either way, my stash rises and falls in an irregular cycle that has a dangerously upward trajectory. 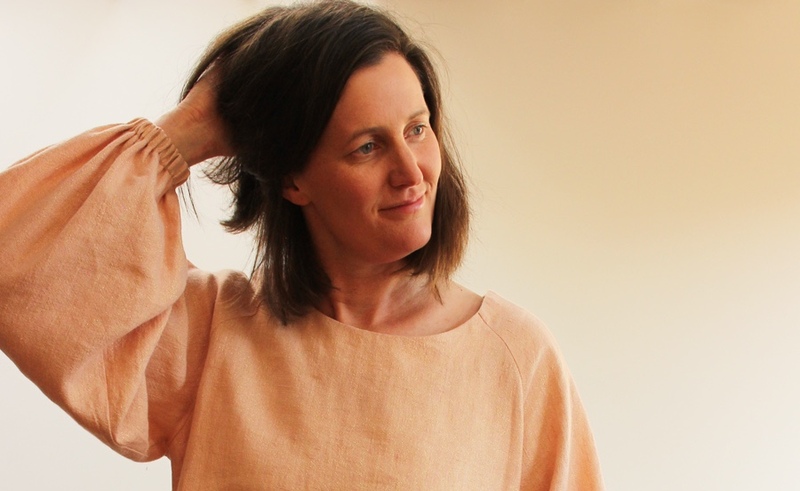 This is me (but I don’t really look like this, usually pulling that hair out not posing…) in my lovely Roho Blouse from Coffee and Thread Patterns, February 2019. I set up this blog about a year ago, February 2018, with a few ambitions/goals in mind but it has largely developed into a documentation of my sewing projects, driven to a huge extent by pattern testing. The wonderful Elles Lanfer of Misusu Patterns gave me my first opportunity, to test the Doris Skirt, in Feb/March 2018 and a year later I have become immersed in the online sewing and pattern testing world. My littlest in her Misusu Pattern’s Doris Skirt, March 2018. I get huge enjoyment from pattern testing. It has given me behind the scenes access to an inspirational sewing community and drives me to expand my skills and push my boundaries with every new project. I also get a lot of satisfaction from helping small scale independent “indie” sewing companies to thrive in such a competitive market. I have been so lucky that each and every testing experience has been rewarding, positive and has continued to strengthen my sewing enthusiasm. The Elsa & Elliot Coat by Threads by Caroline, a pattern test from February 2019. You can find a blog post here on how I hacked that “secret” pocket into it. I would love to further explore and document here the sewing and fabric worlds around Dublin, Ireland and Europe and of course online. Since I was last in sewing mode, about 20 years ago, the range of fabric and patterns available to Irish sewers has vastly changed. Many new shops offering modern, interesting, beautiful fabrics have opened offering fabulous competition to the more traditional shops that have been around for as long as I can remember. The online world has without doubt been a driving force in opening up the Irish market to the amazing potential of European fabric and pattern designers and suppliers. I’d like to spend sometime finding and visiting all our interesting local shops, figuring out what they offer best, what their focus is and at the same time, how to fill the gaps in the domestic fabric range available with what I can get my hands on via online shops. 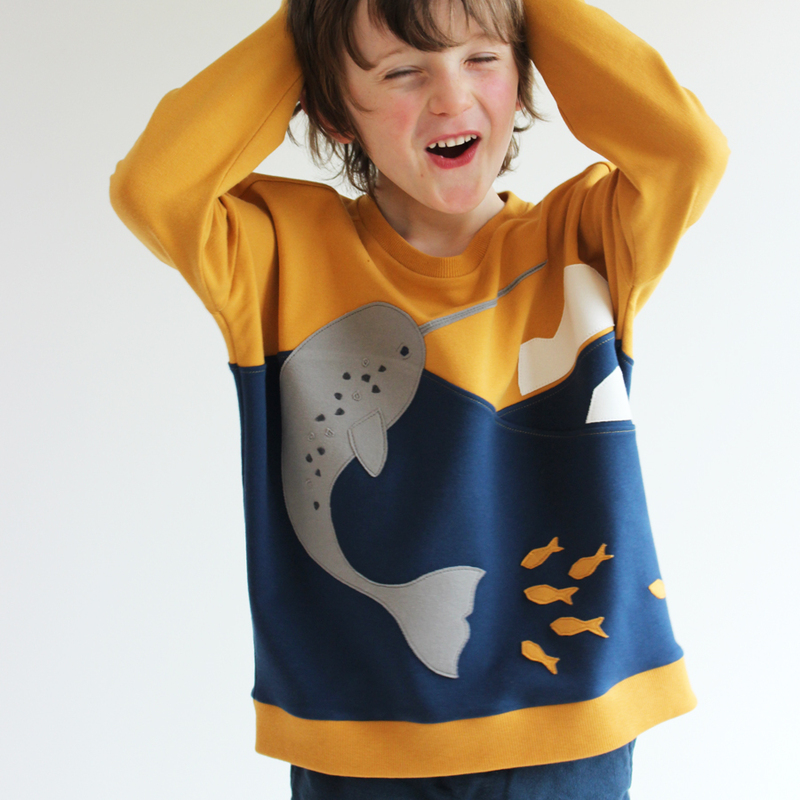 Rhino appliqué on a Misusu Patterns Jolie Sweater. See a blog post here on how I went about creating these appliqués. That’s all for now. Thank you for reading and if you’d like to hear more you could register to receive notifications of my latest blog posts! I also have a facebook page (In Complete Stitches) that you could follow, which I update regularly. x Sarah. Me in my Roho Blouse by Coffee and Thread with my littlest chicken in her Lilah and Niva combo from Sansahash.